Every holiday I try to find one unique gift to give. One year it was personalized gifts. This year I wanted a gift that told a story, which is why I purchased a gift from Novica. Novica is associated with National Geographic. The goal of this company is to create a bridge between consumers and talented artisans across the globe. Through this commerce website, the artisans are given a platform to share their talents with the world. The goal is to spur creativity and sponsor talented individuals. In turn, the patrons receive unique, hard to find items at a great value. To assist holiday shopping, Novica has created a gift finder to narrow the vast number of offerings from around the globe. Whether you are searching for a particular recipient or a specific type of gift, the gift finder can help you find the prefect gift for that person on your list. I used the gift finder to get a gift for my husband from the kids. Since Novica has a large selection of tradesman gifts, I knew that I could find exactly what I wanted. With the help of the gift finder, I searched gifts for him and gifts for home. Earlier this year our family toured Chicago's Chinatown. From the amazing food to the traditional decor, it was a day that everyone enjoyed. My kids and husband fell in love with the good luck cats (it is the cat with the waving paw). 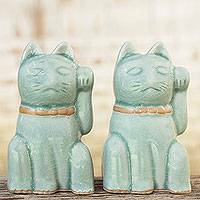 Looking through the Novica gift finder, I was able to find a pair of good luck cats (hopefully my husband isn't reading this post and ruining the surprise). I think that these celadon ceramic cats will be a wonderful addition to our family room. Here is the description from the Novica website. "Known in Japan as Maneki Neko, the bobtail cats holding their left paw are said to attract wealth. According to Feng Shui, the cats should be placed in the wealth area of a house, usually the southeast." I can't wait to see the look on my husband's (and the kids') face on Christmas morning. This gift is just one of the many gifts available on the Novica website. There is a large selection of jewelry, apparel and home decor. From Asian inspired to West Africa and everyone in between, genres of many cultures are represented. This year if you are looking for an unique gift that supports a deserving artistian, consider purchasing from Novica. Novica has graciously given me a $40 gift certificate to give to one of my readers. Please use the Rafflecopter to enter. Disclosure: I received a gift code to use and one to giveaway. All opinions are my own. I'd get the Leather and cultured pearl wrap bracelet, 'Pink Tulip'. I love the Everlasting Kiss wooden sculpture! I'd get a new handbag. I love the Amethyst Stretch Braclet- Lilac Muse! I like the cotton shoulder bag, 'Maya Lake'. It's pretty! Mahogany and cypress wood box, 'Jaguar Spirit' is so fascinating! I'd get the Glass pitcher, 'Cobalt Charm'!